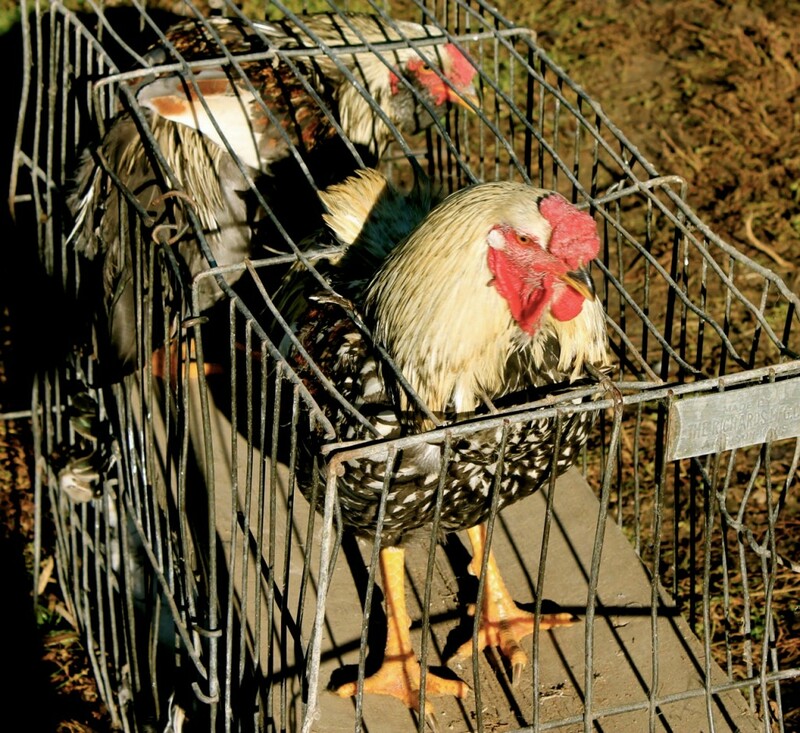 Every chicken keeper needs to have a strategy for what to do with the superfluous roosters. Are you going to sell them, give them away, just put up with them, give them (secretly) to a neighbor, or eat ’em? I vote the latter. I had two accomplished hens last summer show up with chicks. You remember, don’t you, Gentle Reader? I wrote about patient Helen, who sat in a nest in the compost bin, and hatched out four adorable balls of fluff in July. A broody hen successfully hatching out chicks, subsequently becoming a mama, is always cause for rejoicing at our place, where we love babies of every stripe and species. But here’s the thing: out of four chicks born, one or two or three of them will be male, and will–within months–be strutting, crowing, posturing, scrabbling young roosters. To keep too many roosters in your flock will destroy the peace of the hen house and the farmyard. They will embarrass you in front of your friends. They will wake up your neighbors. They may chase your toddlers. They will bring sorrow to your house. We perpetually have too many roosters: doggonit, those little bantam roosters are so cute, they always earn names (“Steve Brody,” “Colonel Klink,” “Sir Galahad,” “Fezzick,” to name a few) and the named chickens are here forever. But I regularly butcher the bigger roosters, to keep the hens from getting too much attention (ahem) and the barnyard from being too crazy. I like a rooster or two, I really do: but in terms of rooster, a little goes a long way. Just a tip: don’t name your roosters anything but names like Dumpling. Potpie, or Stew. Stu? Recently we butchered the “Idiot Quads,” the four mixed-breed roosters that had been driving me crazy for a few months, and I socked two of them away into our (o’erful) freezer, and put two of them in my biggest stockpot to eat with dumplings for supper. This recipe is ease in itself, so if you’ve spent time culling roosters and don’t feel like spending much time in the kitchen, but you need a terrifically delicious dinner to feed to your butchering crew, you’re all set with this recipe. Also you don’t have to use roosters: a meaty old hen will work just as well, as will a chicken from the store. The only hard part is cutting the thing up (unless you keep your knives sharper than I do mine . . . which . . . you probably do). Roosters--with their traditionally tougher meat--are ideal for this dish, which can simmer all afternoon on the stove. Hens or chickens from the store will take much less time to cook, but will taste fantastic, as well. Butter a deep, oven-proof casserole dish that can also be put on stove-top burner, or a dutch oven with a lid. Remove excess skin and fat from chicken pieces, and put into casserole. Stick cloves into the onion pieces. Add all vegetables, herbs, and seasonings, and pour the wine over all. Cover casserole and bake in oven until chicken is barely tender, about 1 to 2 hours (the rooster will take longer to become tender). Don't overcook! Make dumpling dough: Mix dry ingredients in medium bowl. Mix wet ingredients, then add wet to dry, mixing until dough begins to come together. Remove casserole from oven, and put on stove top, on medium heat. Stir sour cream into the casserole, and when the chicken and vegetables are just bubbling, drop the dumplings from a teaspoon all around the edge of the casserole. Simmer 10 minutes uncovered, and then 10 minutes covered. 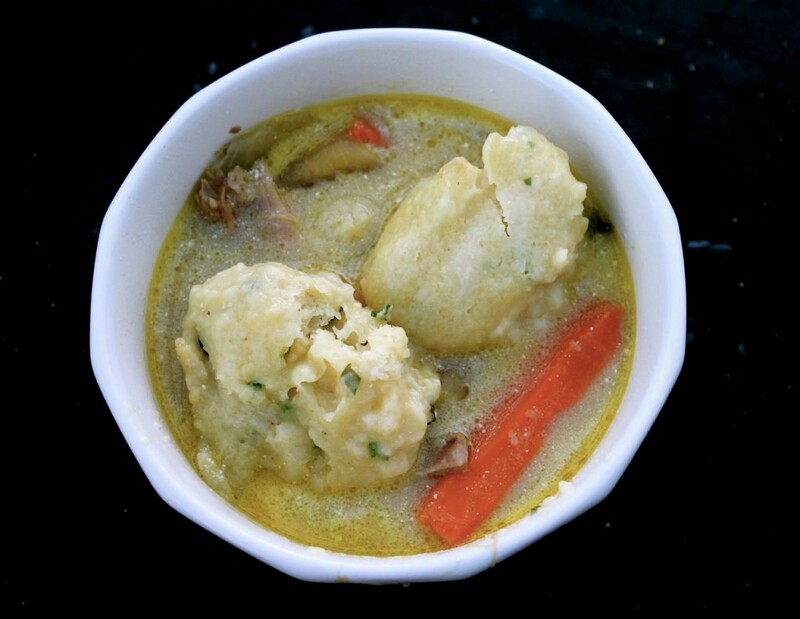 Serve right away, giving each diner a generous portion of stew and several fluffy dumplings. Hi, Amy! Long time no talk to you! Yep, I’m back in the UBC to start off 2015 with a bang! LOL It’s great to reconnect with you. I think since our last FB chat, I’ve raised and now baby six hens, four of them being Rhode Island Reds and two Dominics, for a total of six hens in the coop. I don’t have any roosters as where we live, it would be too noisy to have one. I’m not sure if we would ever butcher any of our hens as they have become pets to me, but I sure do love a good chicken and dumpling recipe. I’ll be sure and save it for a cold day here in NC. Thursday sounds good since the high will only reach 29 degrees! Aletha, it’s so nice to hear from you! It’s been awhile! Blessings to you on your chicken adventures, and in your blogging new year. Sounds like you have some exciting plans! This sounds yummy, but I’m not sure if I could eat my own live stock. I become FAR too attached to animals! We used to raise chickens and had the occasional rooster. There was one in particular that was extra feisty. When we butchered him for meal – his meat was even tough! Amy – As it happens, I put an old retired layer into boil an hour ago for our family’s version of chicken and dumplings. (After eating a goose last night and a duck 3 nights ago.) It had never occurred to me to add herbs to the dumpling batter, which is a bit strange since I add herbs to EVERYTHING. Perfect use for them. Yes, I am still using 100% Nebraska-sourced veg, meat, grains and oultry for our meals, but I am starting to run out of veg; pretty much down to potatoes, sweet potatoes, winter squash, leeks and onions. But I have learned a ton about season extension, preserving the bounty and long-period storage in a cellar this year. Yeh, I know, that is Old Testament stuff, but it surely sounds like Amy Miller to me. Gene, you read Elliot Coleman, don’t you? If not, you should! Having all the kids home for two weeks (in and out), we made quite a dent in the freezer stash: while they were here, we downed several icy gallons of raw apple cider, a couple pounds of beef liver and a beef heart, some steaks (locally grown), frozen sweet corn (grown locally) and beets and turnips and carrots from my own cold cellar (i.e. the corner in Bryan’s shop). Not to mention ginger from the hoophouse, onions and garlic, as well. Also some applesauce made from windfall orchard apples. Such a blessing to be in the possession of such riches! Oh, a few kinds of pickles, too. And honey!! The scripture you shared is simply beautiful. Thank you. I’ve always believed that God created artists so there would be a few folks out there–perhaps not practical or logical types–who would appreciate deeply His creation. It gave me such pleasure this afternoon when we stepped out of the house where Mack takes his piano lesson, to hear the little man gasp and utter “Oh, Mom, take a look at the colors in the sky!” I would say that God created gardeners for the same reason, to show off His creation! I’m so encouraged by you women! Oh how I wish we were friends; if not on earth, I’ll hug you in Heaven sweet Sisters. You encourage me too, Cheryl! Absolutely, Joan, I hope you try it some time! Hi Amy, I loved this! My husband and I love chicken and dumplings too. I’ll have to try this recipe. Thanks. Sarah, and it’s super easy to make, especially if your chicken is already cut up. I hope you’re better soon! Frank, in general, if you have more than one or two roosters per flock (of, say, 25 hens) then you have too many. Extra roos will fight and be quite rough on the girls, too. I usually butcher extra roos once or possibly twice a year, depending on how many I end up with, and how cantankerous they are toward each other. There are many ways to slaughter a roo, but the way that we do it is this: we nail two large nails into a stump about an inch apart, and the butcherer will put the roos’ neck between the nails and use a hatchet to—well, you get the picture. It’s quick and easy. There are many excellent tutorials online. I’ve never written one but maybe I will, the next time we butcher. I must of missed this the frist time round. Maria has too many roosters but can not bring herself to kill one. Once in a while she takes a couple to her brothers house and they make soup for the family (Mexican family’s include anyone with the same last name) I would love to enjoy a little rooster with dumplings if it was not for Maria sitting there and picking out the rooster meat to feed to the dogs because she can’t eat it. Sad, but I don’t think this is working too well. I am spending a lot on chicken food but not seeing any return on the dinner table. Alright, William, there is nothing I would enjoy more than having coffee with Maria and chatting chickens and their care. The manure from the chicken coop is golden, though, if you have a garden. Shovel it out a couple times in the year and make a little compost pile in the corner of the garden that you can pile it in. Add leaves, grass clippings, etc., and in a few months you’ll have a great garden addition. Dig it into the garden in the fall, and in the spring you’ll have people begging you for garden tours because your garden will be so beautiful. If you don’t have a veggie garden, you can add it to your flower plantings, small trees, etc. And meanwhile, the chickens will be busy on another batch! Just remember, don’t feed the trolls.